We had a great time, although hot and sweaty, working on the construction project at the Bible School in Chiang Mai (actually Doi Saket). 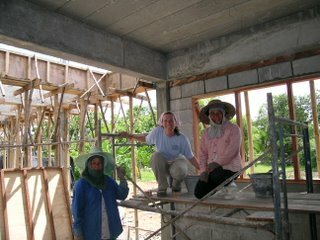 We put up 2" cement block walls, built some forms for cement pillars and other tasks. 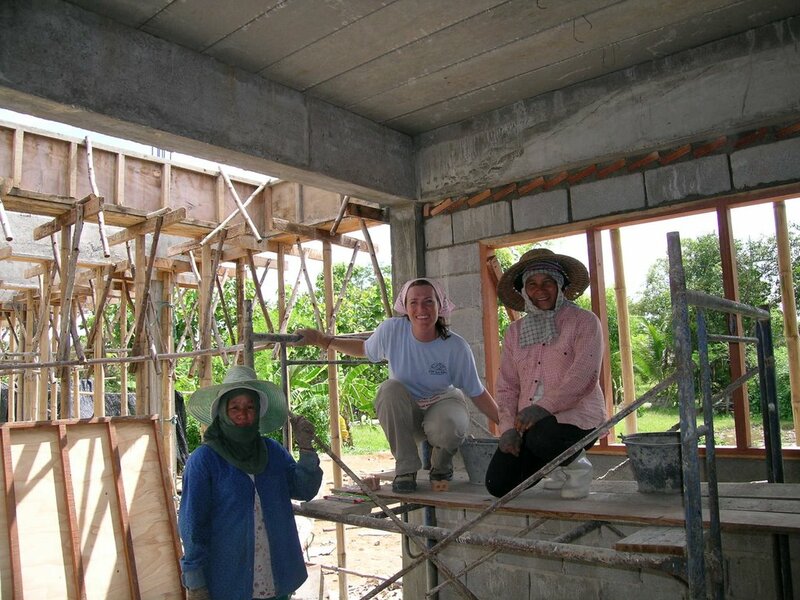 This picture was of my wall and two Lahu workers that were hanging around listening to me sing while I worked. At first, it was just for my own amusement; but in no time, the ladies came over and sat and listened and then I couldn't quit. I started racking my brain for any hymns I could think of. What was really neat, was that that broke the ice with them and led to more contact and "conversations". The lady next to me is Nam Pau and her daughter (whose name I just never could remember) is on the other side standing. I will post more pictures in the next few days. Let me know if there is something specific you'd like to see! Tired and sick, but happy we return from Thailand and three weeks of ministy. My teammates will kill me when they see this picture! :-) I will follow this one with other more serious shots, when I get the disk. We worked hard, played hard and God invested in our lives both as a team and individually. The teens, Matt, John and Jessie were super people. They were very hard workers and flexible eaters! :-) If you've ever had Durian (a supposed fruit) you'll understand! I was impressed with our kids ability to relate to the Thai and Lahu workers at our construction site. They tried the languages and allowed others to laugh at them as they tried; which then opened the hearts of the workers to them. By the time we left there were some heartfelt goodbyes. We visited a Lahu hilltribe village and were so priviledged to enjoy their extreem hospitality and to share in their church services. The team held devo's, daily Bible studies (taught superbly by Gordy Grover -center front of pic. ), memorized verses, worked on the construction site and played mushball (version of baseball) with the Lahu Bible school students were we worked. We enjoyed local food every night at various local "restaurants" and the night market. If you have never had Mango in Asia, you are definately missing something! wow. I miss our team tons, and have brought home with me some character training via the Holy Spirit, and a desire to grow in the area of teaching as well as great memories. I miss the Lahu leadership at the Bible School, both the men (Ajan Marting, & Ajan Idocam) and their wives! I was to bring their greeting back home to my friends! So, Aw bou ui ja! More pic's will follow in the next few days!